How do I add a to-do item in the List View Dashboard as a student? You can create to-do items that display in the List View Dashboard agenda. When you create a to-do item, the new item displays your profile picture to differentiate it from other to-do list items. 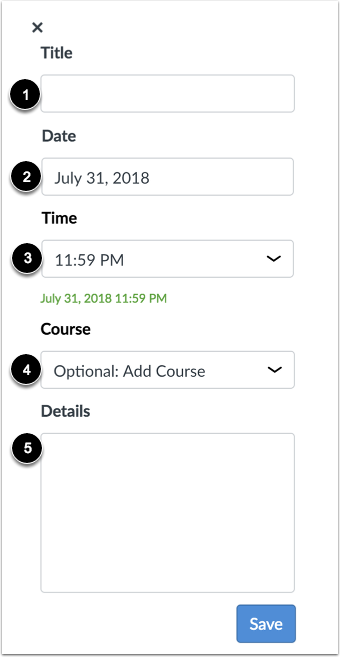 Any to-do item you create also displays in the Course Card Dashboard View sidebar and Global Activity Stream Dashboard sidebar. You can also create to-do items from the calendar. Click the Add To Do button. In the To Do sidebar Title field , type a name for the to-do item. The Date field defaults to the current date , and the Time field defaults to 11:59pm . To change the date and/or time when you want to complete the item, modify the date or time appropriately. Items default as general to-do items, but you can associate the item with a course by selecting a course from the Course drop-down menu . In the Details field , any other details about your to-do item. Items that you associate with a course display on the to-do list with other course to-do items . Items that are not associated with a specific course display at the bottom of the day's to-do list . To edit or delete a To-Do item, click the Edit icon . To edit the item, edit the information in the To Do details sidebar . To save your edits, click the Save button . To delete the item, click the Delete button . When the delete confirmation window displays, click the OK button. Previous Topic:How do I use the to-do list for all my courses in the List View Dashboard as a student? Next Topic:How do I view global activity for all my courses in the Recent Activity Dashboard as a student? Table of Contents > Global Navigation > How do I add a to-do item in the List View Dashboard as a student? When I tried to add a Sunday date, it would change it to either the Saturday before or Monday after. Only after I changed the time was I able to select a Sunday date. Is there a reason why I cannot choose a Sunday date without this workaround? That's really strange. I'd suggest submitting a ticket to Canvas Support, if you haven't already. Here's a guide that will walk you through how to report a problem to Canvas Support: How do I get help with Canvas as an instructor? I know it's only been a short week since we replied to your comment, but I wanted to reach out and make sure that you were able to reach out to Canvas Support. Please let us know if there's anything else we can help with or if you have any further questions that you think we can help answer. In the meantime, as you know, we periodically remove comments from the Canvas Guides. If your comment thread here disappears in several weeks, you'll know that we've just done some housekeeping in an effort to keep the guides updated. Thank you for following up with me. I have contacted Canvas Support and they have given it a case number and are working on the issue. I have posted in the Q&A section as well: Why can't I choose a Sunday date when adding a to-do item in the List View Dashboard? and will update any progress there once it is received. Thanks for the update. I'm glad to hear they're looking into it. Re: Add items in To-do list?